The average fastball in Major League Baseball is 91 mph. It really is rare to find a pitcher that can consistently throw high 90’s for strikes. The up and coming star pitcher that everyone in raving about, Steven Strasburg, is one of them. He is absolutely amazing to watch and most people know who he is. Why? Because he throws very hard. He’s been clocked at 103 before, throws a 90 mph changeup and a 80 mph curveball that is unlike any curveball any hitter has ever seen in the big leagues. What an amazing combination of pitches. So how do other pitchers have success on the mound? The average pitcher who can throw 91, which many college and some high school pitchers already do, how can they compete at a major league level? Well, one obvious answer is a combination of velocity, control and change of speed. If you cover those three, which I have already written about in a previous blog post and article on this site; you have a winning combination. But what about the mental side of baseball? 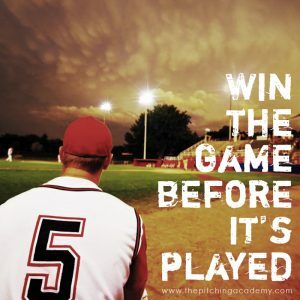 Do you think just thinking about success before you pitch will help you win more games and be a more effective pitcher? Do you think if pitchers controlled their emotions and really did pitch one pitch at a time they would be much more sufficient pitchers? I know so. There is a lot to the mental game that most pitchers don’t understand. Some of it is due to coaches inability to teach it to their players and their true lack of knowledge on the concept. I am reading Heads-Up Baseball right now and am learning even more about the mental game of baseball. Jim Abbott, who writes the foreword to the book, says that once a player reaches the major league level throwing strikes isn’t an issue. However, it is said at that level if a pitcher does has control problems they are 90 percent mental. Something else is inhibiting them to throw strikes. I know that if one of my pitchers struggles with control in a game, it is definitely a problem between his two ears. I am also convinced that the difference between many of the pitchers playing minor league ball compared to pitchers in the major leagues, is that those in major league baseball have become better at controlling their emotions and don’t let their emotions get the best of them. Most athletes spend the majority of their time on the physical aspects of the game (which are important) and ignore what is going to make them even better; the mental side. I have read many books about the mental game but nothing compares to heads-up Baseball when it comes to understanding and immediately applying what is taught. It is such a simple read and full of great insight that, once applied, will truly take you to the next level. I highly recommend it to anyone! To sum things up here pitching faster is great but there are many other aspects of pitching that will help you more than pitching velocity. Don’t get me wrong here! Throwing a great fastball helps set hitters up for effective off speed pitches. However, the deadly combination of Location, change of speed and movement are all fundamental factors to a pitchers success. The mental game is essential to success!